Join "The Prince of Preachers" as he marvels at the power of Christ's prayer life. Spurgeon paints masterful word pictures of Christ the intercessors - at daybreak, through whole nights, at Gethsemane, praying for sinners, for His people's sanctification and unity, for Peter, for those who are bowed down. All are marvelously instructive for us. 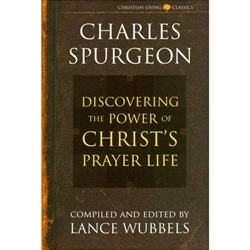 But what transformed Spurgeon most was this scripture: "He ever liveth to make intercession for us." Not only did Christ lay down his life for us through His death but the whole life of Christ throughout eternity - His boundless, endless, glorified existence - is still for us! Sit at the foot of His throne, and, as far as your eyes will permit, behold His splendor, and see how He spends His glory-life in perpetual intercession for you. We are never hidden from the all-seeing eye of the divine Mediator. What a life-changing message to read about!